"When you are looking, a cat acts like a princess, but the minute they think you are not looking, a cat acts like a fool." I am here with an art journal page I made for the current Unity Friends with Flair link up. I used a little bit of everything this time. But instead of the kitchen sink...I used the freezer! This mess means I am having fun. Will somebody please tell my hubby that!! Yep.....it's the top of my freezer posing as my mixed media workbench!! I remember the smile that spread across my face this year when I saw a kingbird on my fence, surveying our pasture, ready for any errant flying insects. I am not good at drawing freehand, so I needed a photo to help me sketch out this monarch. My fence is metal, but I liked this wooden perch better, so I used it as my inspiration. I sketched out my bird shape on scratch paper and then used my copier to reduce it to the right size for my page. Then I cut it out and traced it onto some pale gray cardstock and cut that second one out to use on my page. From there, I used Gelatos in black and gray to color the darker areas, rubbing the colors in with my finger, moistened with a baby wipe, to blend. I colored his crown with a metallic gold marker, and added a few feather marks and other features with an ultra-fine black marker. Yah, I am so coooool.....umm...regal. 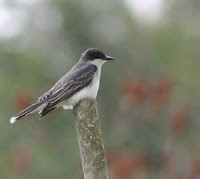 By the way, did you know the kingbird is named such because of the tiny tuft of bright feathers hidden on the head of the male? 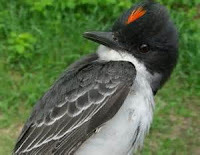 It is rarely seen, but he can display it to impress the ladies or to show other males how regal he is. I used a large variety of different products on my page including some Unity stamps from grab bags and a feather from Unity - Feather Flight. 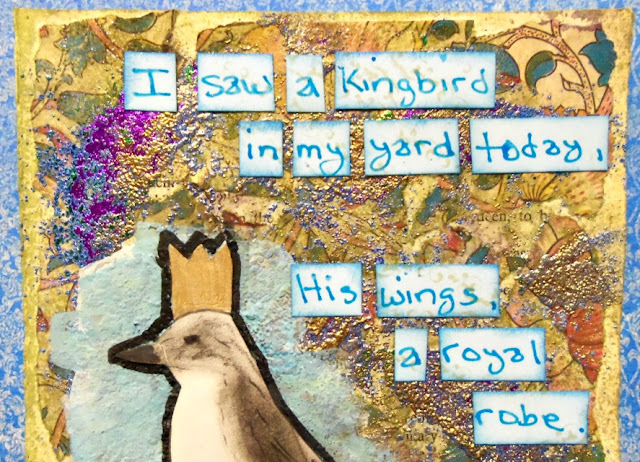 I used purple and green Clearsnap - Designer Foils and Stampendous - Stamp and Bond Embossing Powder with the feathers and tons of other embossing powders in turquoise and gold. I love all the rich colors and textures and all the shine!!! I tinted gesso with blue Gelatos to make a background for my bird. I like the stucco effect. I sketched in a fence and colored it with Gelatos, using the same technique of rubbing with a wet finger to blend. 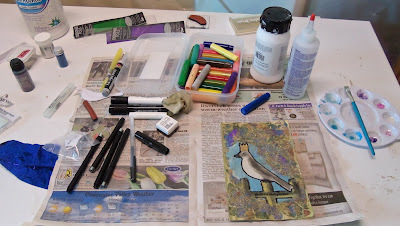 Then I glued the royal avian onto the page and outlined everything with a black Faber-Castell Pitt Big Brush Marker. I drew in the feet with a black marker. I wrote out my verse (Yes, I really did something in my own handwriting!) on strips of pale blue cardstock that I had previous stamped in Simon Says Stamp - Khaki ink with a Unity grab bag stamp. The pattern is very subtle, but adds depth, with the writing over the top of the stamping. I inked around the edges of the strips with Salty Ocean Distress Ink. Whew!!! That was a long description of my process! Thanks for politely scrolling down patiently plowing through it with me. All this process is still very new to me. One thing that I LOVE about art journal pages is that I can capture a thought or a moment of inspiration and put it down on a page. I would never have made this into a card, but it is perfect for an art journal page!! This was a lot of fun and I hope you have enjoyed seeing it. Thanks so much for stopping by. I appreciate each of you very, very much!!! 4. 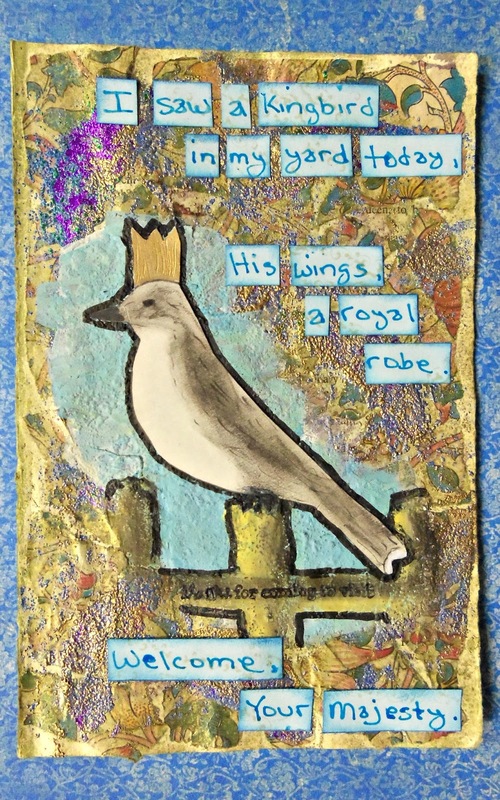 Design Memory Craft June Challenge - Find an inspiration piece and make an art journal page from it. WOW Amazing project. I love it. very nice project with lots of details and texture. Thank you for sharing with us at DRS Designs this week. Cool. 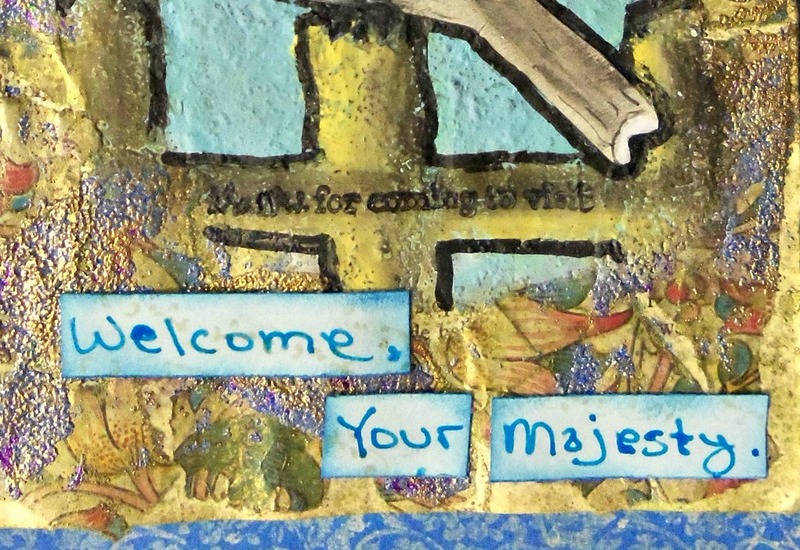 It is an awesome art journal page and the background is really pretty too. TFS! This is super fun. Love the look, fun sentiment on the fence, and your personal verse is super cool. Very creative and thanks for sharing it with us in the DRS Designs Challenge! You have truly become a mixed media artist!! I am so in love with this!! And you totally "get it"! That is exactly what art journaling is! It is about documenting a moment. Not documenting like scrapbooking, that is documenting for future generations, this is documenting this one moment and how it made you feel. You were so happy to see that bird and now, when you look through your journal you can get that feeling again and again!! I'm sorry I haven't gotten back to you yet. I've been soo super busy with the end of the school year and stuff. But I promise I will! This turned out awesome. I use the top of my freezer for projects too. First off, I think you're crazy to say you're not good at drawing free-hand! I adore this bird and thought it was a professional stamp when I first saw it! I love how it turned out and was very impressed with your free-handing! I thought it was so clever of you to make a King Bird into a king with a crown and it made me smile. I also liked how you outlined him in black to really make him stand out. Your journaling also sounded so poetic, so the English major in me really appreciated the art AND the words! Really nifty piece here and who would've known what amazing things could be created on top of a freezer?? Thanks for sharing this with us here at the Simon Says Stamp Monday Challenge! You have been busy this past week or so with all these projects and fancy techniques. 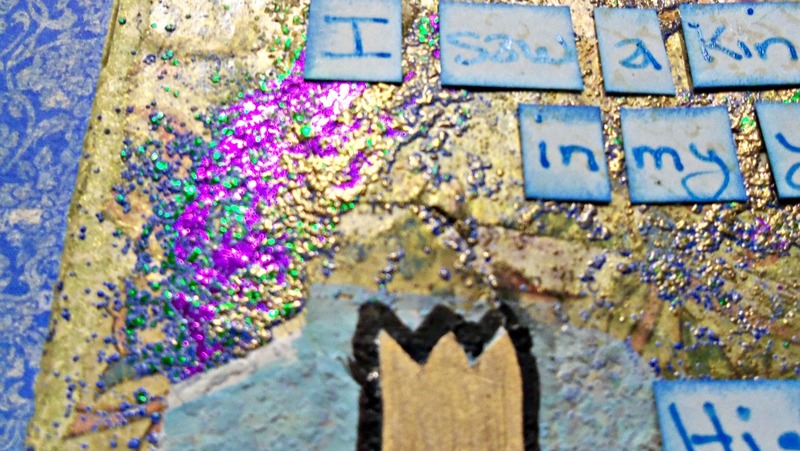 I'll bet this journal page is even more amazing in person with all the texture and glimmer! When I first saw it, I thought you used micro beads but I see that it's designer foil. The purple and green just POP against the gold background. By the way, what genius to recycle the gift paper as your base because that is gorgeous stuff. Gesso, gelatos, and then I find out that you drew the Kingbird free-hand...yikes! You got such a soft, natural look with your technique that really makes the glittery metallics stand out even more. I love that the rough texture of all that embossing powder slightly obscures the little sentiment on his perch because it makes it seem like a personal communication between you and the bird. This is almost too beautiful to hide in an art journal..you should frame it! Just wanted to stop by and say congrats on winning Mou's challenge at the Faber-Castell Design Memory Craft blog. What a fun page and I enjoyed reading about your art journaling process and the moment that inspired your page. Thanks for sharing your wonderful mixed media techniques.